In the past, I have shown you how to sort a HashMap by values in Java, but that was using traditional techniques of pre-Java 8 world. Now the time has changed and Java has evolved into a programming language which can also do functional programming. How can you, a Java Programmer take advantage of that fact to do your day to day task better like how do you sort a Map by values in Java using lambda expressions and Stream API. That's what you are going to learn in this article. It will serve two purposes, first, it will tell you a new way to sort a Map by values in Java, and, second and more important it will introduce you to essential Java 8 features like Lambda Expression and Streams, which every Java Programmer should learn. By the way, it's not just the lambda expression and stream which makes coding fun in Java 8, but also all the new API methods added into an existing interface like Comparator, Map.Entry which makes day-to-day coding much easier. This evaluation of existing interfaces was possible by introducing the non-abstract method on interfaces like default methods and static methods. Because of this path-breaking feature, it's possible to add new methods into existing Java interface and Java API designers have taken advantage to add much-needed methods on popular existing interfaces. One of the best examples of this is java.util.Comparator interface which has now got comparing() and thenComparing() methods to chain multiple comparators, making it easier to compare an object by multiple fields, which was very tedious and requires a lot of nesting prior to Java 8. The Map.Entry class, which is a nested static class of java.util.Map interface is also not behind, it has got two additional methods comparingByKey() and comparingByValue() which can be used to sort a Map by key and values. 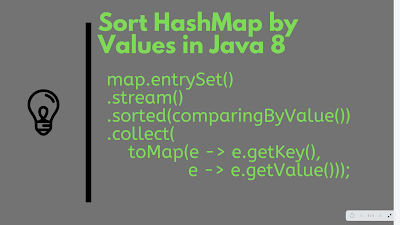 They can be used along with sorted() method of Stream to sort a HashMap by values in Java. 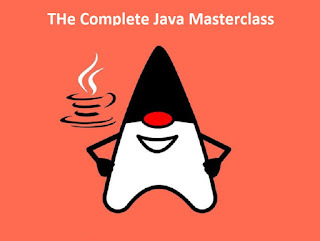 Btw, if you are new into Java world then I suggest you to start learning from Java 8 itself, no need to learn the old techniques of doing a common task like sorting a list or map, working with date and time, etc and if you need some help, you can also look at comprehensive online Java courses like The Complete Java MasterClass, which will not only teach you all this but much more. It's also most up-to-date course, always updated to cover latest Java versions like Java 11. You can sort a Map like a HashMap, LinkedHashMap, or TreeMap in Java 8 by using the sorted() method of java.util.stream.Stream class. These means accepts a Comparator, which can be used for sorting. If you want to sort by values then you can simply use the comparingByValue() method of the Map.Entry class. This method is newly added in Java 8 to make it easier for sorting. This is the right way to sort a Map by values in Java 8 because now the ordering will not be lost as Collector is using LinkedHashMap to store entries. This is also a good example of using constructor reference in Java 8. You can read more about that in the Collections to Streams in Java 8 Using Lambda Expressions course on Pluralsight, which provide an in-depth explanation of new Java 8 features. In order to sort a Map by values in decreasing order, we just need to pass a Comparator which sort it in the reverse order. You can use the reversed() method of java.util.Comparator purpose to reverse order of a Comparator. This method is also newly added in the Comparator class in JDK 8. The key point here is the use of the reversed() method, the rest of the code is the same as the previous example. In the first step you get the entry set from the Map, then you get the stream, then you sorted elements of the stream using sorted() method, which needs a comparator. You supply a Comparator which compares by values and then reversed it so that entries will be ordered in the decreasing order. Finally, you collected all elements into a Map and you asked Collector to use the LinkedHashMap by using constructor reference, which is similar to method reference in Java 8 but instead of using method name it uses Class::new, that's it. 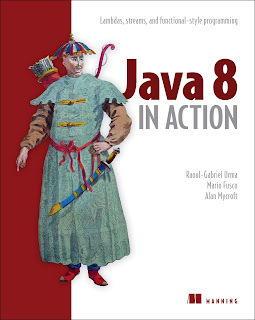 If you are interested, you can learn about it any good Java 8 book like Java 8 in Action or Java SE 8 for Really Impatient by Cay S. Horstmann. Use LinkedHashMap for collecting the result to keep the sorting intact. Use static import for better readability e.g. static import Map.Entry nested class. Use new comparingByKey() and comparingByValue() method from Map.Entry they were added in Java 8 to make sorting by key and value easier in Java. Use Collectors to collect the result into a Map but always use LinkedHashMap because it maintains the insertion order. You can learn more about lambda expression and method reference used in our example in a good Java 8 course like The Complete Java MasterClass on Udemy. 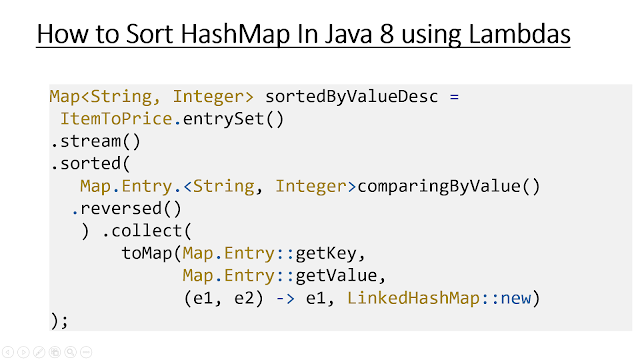 Here is our complete Java program to sort a HashMap by values in Java 8 using a lambda expression, method reference, and new methods introduced in JDK 8 like Map.Entry.comparingByValue() method, which makes it easier to sort the Map by values. System.out.println("Map incorrectly sorted by value in ascending order: "
System.out.println("Map sorted by value in increasing order: "
System.out.println("Map sorted by value in descending order: "
You can see that the map is sorted now by values, which are integers. In this first example, we have printed all entries in sorted order and that's why Acer HD Monitor comes first because it is least expensive, while Apple iPhone comes last because it is most expensive. In the second example, even though we sorted in the same way as before, the end result is not what you have expected because we failed to collect the result into a Map which keeps them in the order they were i.e. we should have used LinkedHashMap, which keeps entries in the order they were inserted. In the third and fourth example, we rectified our mistake and collected the result of the sorted stream into a LinkedHashMap, hence we have entries in sorted order. The last example, sort entries in descending order hence, Apple comes first and Acer comes last. That's all about how to sort a Map by values in Java 8. you can use this technique to sort any Map implementations like HashMap, Hashtable, ConcurrentHashMap, TreeMap etc. If you don't need to print the values or perform any operation, but you just need a sorted Map then make sure you use collect() method to store sorted entries into another Map. Also, when you use the Collector to collect element from sorted Stream, make sure you use LinkedHashMap to collect the result, otherwise ordering will be lost. Thanks for reading this tutorial so far. If you like this example of sorting HashMap in Java 8 using lambda expression then please share with your friends and colleagues. If you have any question, feedback, or suggestion then please drop a comment. P. S. - If your goal is to learn new features introduced in Java 8 then you can also check out the free Java 8 courses which only focuses on new features and nothing else. What's the time complexity of this sort? Time complexity of this sort?